Ok, the camera on my computer has decided to work again, so I've tried to get a picture to prove that my hair is going white, as I asserted earlier. The loose ends at the top are just catching the light, but the bottom center and bottom left are a different story. Am I right? Also, there is more on my crown, but I can't really photograph that well myself. I can't entirely explain why this is such a big deal to me. If you don't, people won't love you anymore. If you do, people will throw money at your feet and virgins will line up at your door. Also, at least you're not going bald! You're turning into a unicorn! Okay, good, I'm not the only one who saw the obvious connection. Not sure you count though. Hawt. It means you can become a politician sooner. The more distinguished you look the more likely it is you will be voted into office. It is also your affinity for the frosty weather showing through your scalp. You are so very blond that it will be hard for the general population to notice for a few years yet. 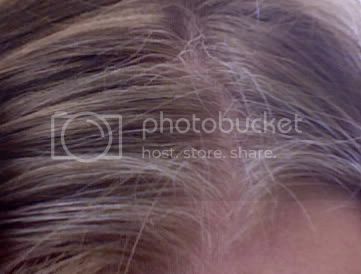 Eh, it happens, my dad started going gray at 25, and I know I've found a few silver hairs. The thing is, I know my family and I've already asked the older relatives I have. This hasn't happened in my family before. Nobody has even really started to go gray before 45. My brother is blond. No one else in my family has hair other than dark brown. You have to go back to my great great grandfather before you find red hair. Still no blond. Genetics is funny stuff.